This page deals with plants that are aggressively invasive, crowding out our native plants, and only the invasive plants that are exotic, that is, imported not native or domestic. This page does not deal with invasive insects or diseases. Some of these documents are excerpts from the "Invasive Plants Field and Reference Guide" by the USDA Forest Service, NA-TP-05-04, July 2007 revision. As such, they do an excellent job of describing the characteristics and "habits" of the invasive plants and have a good glossary of terms used in their descriptions. The original document can be downloaded HERE ( 1.6 MB pdf ). 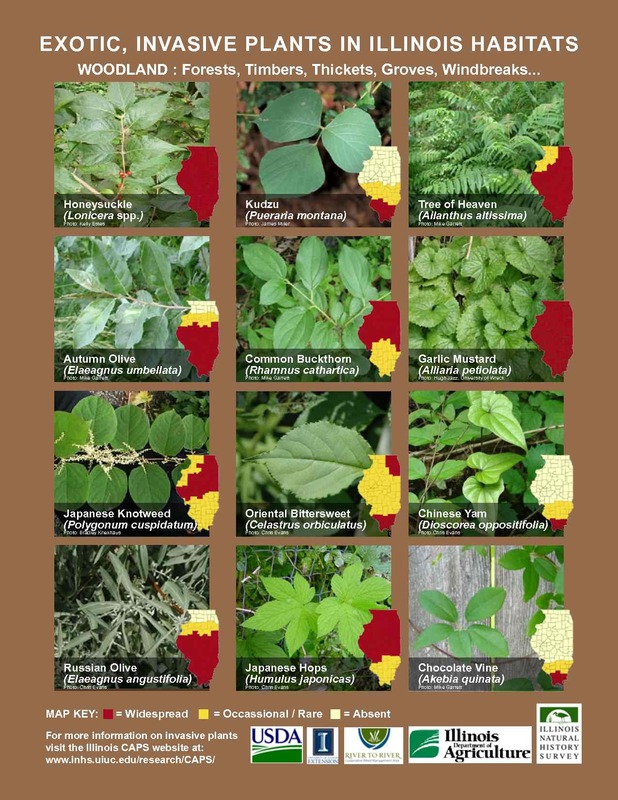 Five organizations including the University of Illinois Cooperative Extension and the Illinois Natural History Survey have published a concise two-page guide to exotic invasive plants in Illinois woodlands, pictured on the right. The guide describes 16 of the most important threats with pictures and maps showing their spread. The maps need an update, for they indicate Autumn Olive hasn't reached the northern twenty counties in Illinois, but it is in northwestern Jo Daviess County. Download the Guide by clicking HERE ( 2.3 MB pdf ). Also, a group of governmental and non-governmental organizations has joined in cooperative efforts to fight the spread of invasive plants in the Midwest across Iowa, Illinois, Indiana, Michigan, Minnesota, Ohio, and Wisconsin. This is the Midwest Invasive Plant Network (www.mipn.org). They sponsor education and publish information. You can download their "Why Should I Care about Invasive Plants?" (1.2 MB pdf) - which will help you explain to your neighbors why they should join in fighting these plants - and their "New Invasives Flyer" (206 KB pdf). Lastly, thanks to the MIPN above, you also can download the "Weed Control Methods Handbook" (1.5 MB pdf) of The Nature Conservancy which describes manual, mechanical, grazing, burning, biological, and chemical methods for fighting invasive species. While we realize it would be helpful to provide methods of controlling these species, it is not practical. The authors of the field guide say it best, "Control methods for each species are not provided. The most successful control methods are most often site-specific; over-generalizing control methods might lead to poor management and frustrating outcomes." That said, there is an article about "Prioritizing Invasive Plant Control" which gives you a method to determine the order in which to attack the invasives on your land. Also, the Forest Service has published Fact Sheets on several invasives; these Fact Sheets include a section on available methods of control. The available Fact Sheets are downloadable in the list below. from top to bottom, as greatest to least threats to Illinois forests. Following the common name and scientific name, there are links to more information for certain invasives. Worst Invasives. Species currently causing the greatest problems in Illinois forests. Widespread Invasives. Plants found in forests in much of the state.